As I was looking for small stuff (nudibranchs, shrimps, etc…) in Marsa Shagra, I came across this fish which was about 3 cm long. 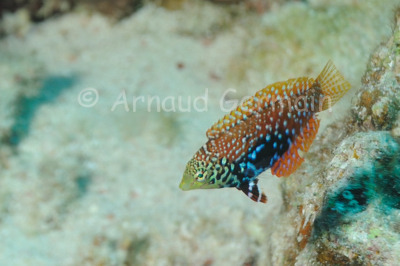 From the shape, I deducted that it was a wrasse, but despite looking in different books, I could not get the exact species. I finally got it when I downloaded an app on my kindle from the Markus Debelius book. Nikon D700, Nikon 28-105 mm macro at 105mm, F8, 1/60th, ISO 200, Ikelite Housing and Ikelite DS160 strobe set on TTL +0.3EV.